Martin Newman of Plumerai returns with his project Goddakk for a five minute journey through psychedelic existential dread. Goddakk’s ‘III’ manages to be quite mysterious. ‘III’ creates a strange ambient shoegaze sound similar to Loveliescrushing. Like that larger outfit, Goddakk eschew any form of traditional rhythm. Rather the distorted noise from the guitars provides the only comfort. With an incredible focus on how simple things can expand into new territory, ‘III’ explores with the minimal space it has. It soars into the sky in spite of its limited time. Each one of these songs feels completely separated from the other. Together they form a rather diverse bunch of moods, attitudes, and emotions. None of them feel particularly coherent but that’s part of the charm, to capture a moment. ‘Not Enough’ is aptly named. With the guitar and bass merging together perfectly it creates a sense of floating ever upwards. The bass helps with this expression allowing itself a great deal of dexterity. It is a pity that the song is so short. ‘The Wait’ is a considerably sparser song. Distance is conveyed. Goddakk work hard to keep the sound from getting too unified. Leaving it separated makes it true to its name. ‘A Void Dance’ sounds completely gone. This is a wasted song. Guitars squall their way. When the deeper frequencies come in the song feels nearly drunk off its own power, stumbling around wherever it can. ‘Travel Guide’ lumbers. For the finale of ‘The Borrowers’ Goddakk take a particularly warm touch to the sound. Returning to the beginning of the EP’s sound it manages once more to soar into the sky, dissipating away into nothing. Goddakk are a band from Boston, Massachuessetts that plays a very experimental form of guitar driven drone/experimental noise and this is a review of their 2013 ep "III" which was released by Siber Records. Synths bring a very experimental and dark ambient sound to the recording, while the guitars bring in a distorted experimental drone/noise sound to the music combining both heaviness and soft elements and there are no vocals or songwriting present on this recording, as for the production it has a very dark, raw and primitive sound to it. In my opinion Goddakk are a very great sounding hybrid of experimental, drone and noise and if you are a fan of this musical genre, you should check out this ep. RECOMMENDED TRACKS INCLUDE "Not Enough" and "The Borrowers". RECOMMENDED BUY. 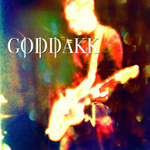 US project GODDAKK is the creative moniker used by guitarist Martin Newman of Plumerai for his solo efforts. The EP “III” should logically be the third of his solo excursions so far, and was released on US label Silber Records as a part of an experimental series of EPs made under the condition 5 songs in 5 minutes. Newman’s take on this challenge has been to produce five short, atmospheric pieces, with ambient tendencies and textures instrument details as the main ingredients. As conclusive or inconclusive as such material can be, depending on your individual taste for music of this kind I guess. Not Enough opens with a subtle bass and reverberating light guitar notes covered in a smooth, melodic texture. The Wait follows with slowly plucked guitar notes and nervously resonating guitar notes in a distanced sounding arrangement and a subtle textured noise motif. A Void Dance repeats this setup, but now with bass and guitar plus reverbs/effects. Travel Guide features slow bass with resonating light toned guitar licks and gently surging noise textures and finally The Borrowers maintains the bass presence now with an echoing, reverberating guitar noise texture and subtle haunting melodic overlays. A well made 5 minute trek into a world of ambient, textured guitar motifs with haunting atmospheres, and most likely with fans of post rock as a likely key audience.